The Hassle continues with its revamped programming of underexposed cinema with this first installment of CAFFENOL: monthly experimental films, music, and sustenance! 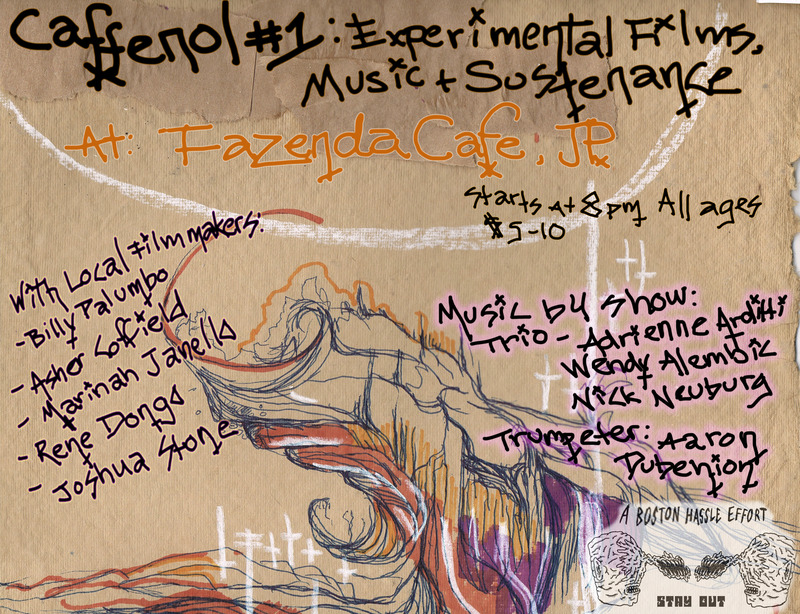 Come out to Brassica Kitchen (aka the Fazenda Cafe space) on Monday, May 2nd from 7:00–10:30pm for coffee- and alcohol-type drinks, food, live music, and 75 minutes worth of experimental shorts by local filmmakers in an intimate setting (45-person max!). Works being shown include identity explorations projected on 16mm, found footage collages, computer-generated color explosions, VHS ambient meditations, a mystical Bahamian ethnography, and more. Music before the show featuring the trio of Adrienne Arditti, Wendy Eisenberg, Nick Neuburg + trumpeter Aaron Dubenion. Big thanks to Krystle Brown for the flier! Please be respectful of those around you! We strive to be a safer space so any offensive behavior or language including racism, sexism, ablism, body shaming, transphobia, homophobia, xenophobia, etc. is unwelcome.